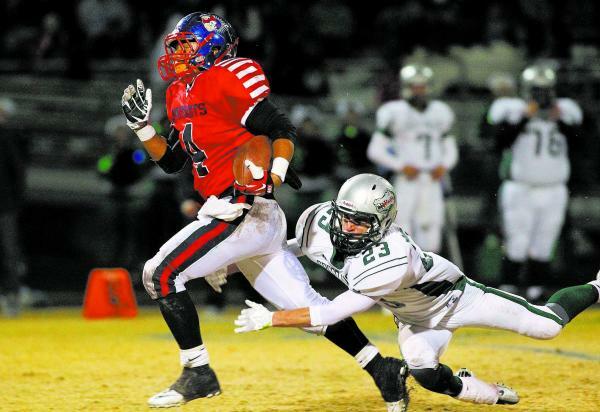 Liberty's Ethan Tuilagi (4) tries to run past Green Valley's Albert Lake. 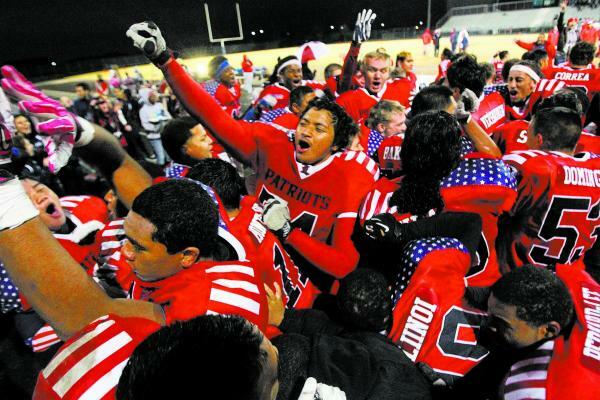 Tuilagi had a pair of rushing TDs, recovered two fumbles and had two sacks to help Liberty to the Sunrise Region title. 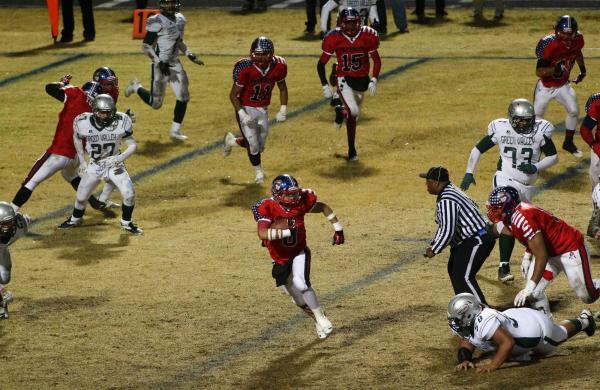 Liberty's Spencer Wilson (8) looks for running room after intercepting a pass against Green Valley. Liberty's Drew Hladek (2) concentrates on the ball as he is being chased by Green Valley's Kyle Parker. Hladek caught two TD passes. 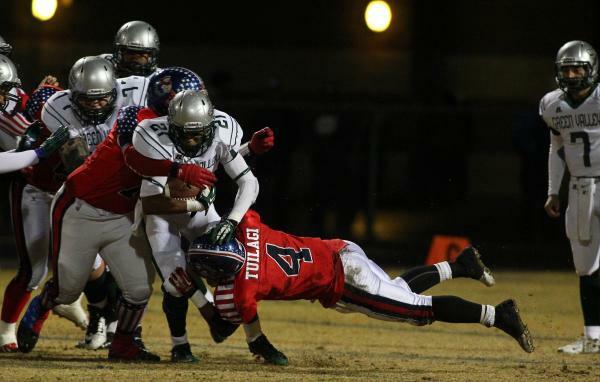 Green Valley's Larry Norman tries to break a tackle by Liberty's Ethan Tuilagi (4). 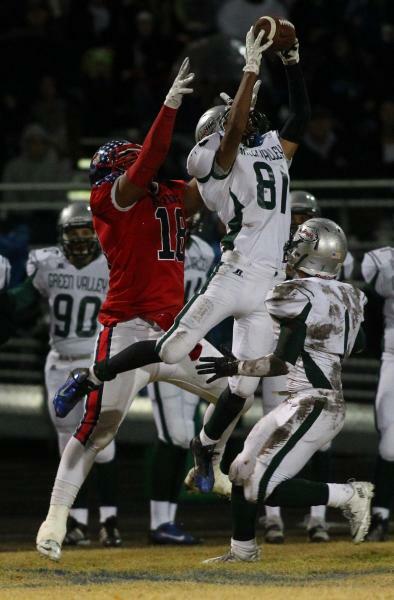 Green Valley's Kyle Parker (81) leaps to intercept a pass intended for Liberty's Noah Jefferson (18). 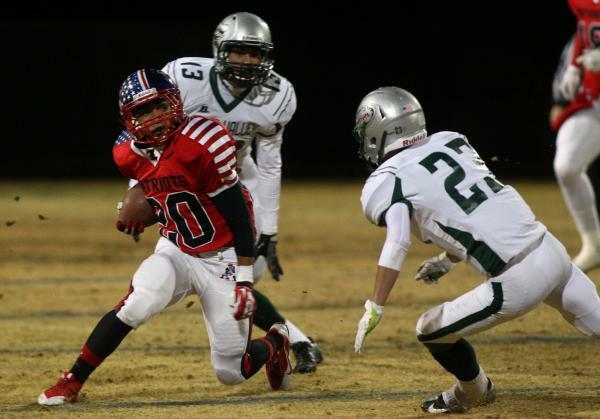 Liberty's Darrien Acohido (20) looks for running room against Green Valley's Albert Lake (23). 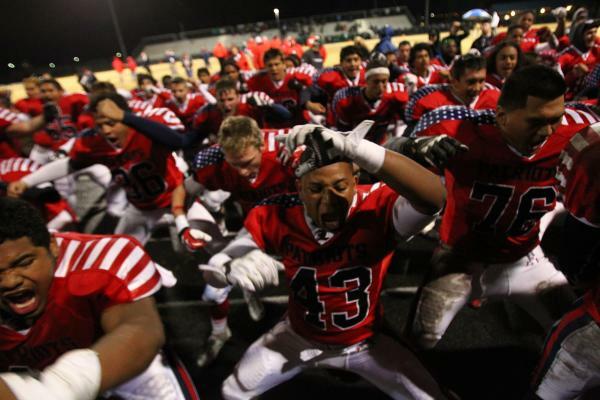 Liberty players do a celebratory haka after the game. Liberty players celebrate after their win over Green Valley in the Sunrise Region final. As the fourth quarter started Friday night, Liberty punched in a touchdown to go up 43-16 and appeared to be cruising to a fourth consecutive Sunrise Region title. But someone forgot to tell Green Valley. The Gators more than made it interesting before their comeback finally ran out of steam, and Liberty held on for a 56-43 home win. After an 18-yard touchdown run by Ethan Tuilagi made it 43-16 with 11:22 to play, the Gators (9-3) scored twice in a little more than three minutes. Christian Lopez hit Markus Varner with a 13-yard TD pass, then passed to Albert Lake for the 2-point conversion to make it 43-24 with 9:24 to play. The Gators recovered the onside kick, and drove 48 yards on five plays, capped by a 17-yard TD pass from Lopez to Giovanni Hernandez with 8:11 to play. Liberty’s Curtis Washington appeared to have a bead on the pass, but Hernandez got a hand in to prevent the interception. The ball popped straight up, and Hernandez grabbed it and tiptoed around the pylon for the score. The Gators weren’t done. Hernandez intercepted a pass on the ensuing drive, returning it 25 yards to the Liberty 40. And Green Valley then turned to the double pass, with Lopez tossing a lateral to Kyler Chavez, who found a wide-open Conor Perkins streaking down the left sideline for a TD pass. Perkins hit the extra point to make it 43-37 with 5:58 to go. Bryan Roland returned the next kickoff 55 yards to the Green Valley 27, and four plays later Calvin Tubbs scored on a 10-yard run to push the lead to 50-37 for Liberty (10-3), which has won nine straight games. It was the second big return to help set up a score. Matt Powell returned a punt 43 yards to set up Tuilagi’s earlier score. Jarvis Polu had a pair of sacks on the ensuing possession, including one on fourth-and-16 to give Liberty the ball back, and Tuilagi iced the game with a 19-yard TD run that made it 56-37 with 2:21 to go. Tuilagi finished with 61 yards on eight carries, but had a bigger impact on defense and special teams. He recovered a pair of fumbles on Green Valley kick returns, had a tackle for loss and two sacks. Liberty plays at Northern champion Reed in the Division I state semifinal on Nov. 30. 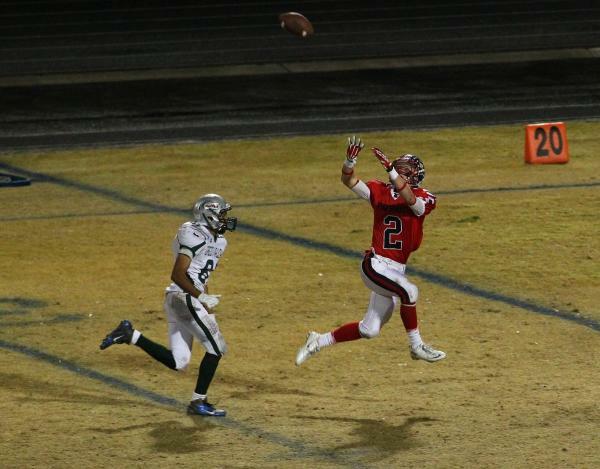 Tyler Newman passed for 258 yards and four TDs for Liberty, but was picked off four times. Drew Hladek finished with six catches for 121 yards and two TDs. Lopez, who had a 7-yard TD run on the game’s final play, threw for 342 yards and three TDs. He also had a pair of TD runs for the Gators, who were playing in the region final for the first time.